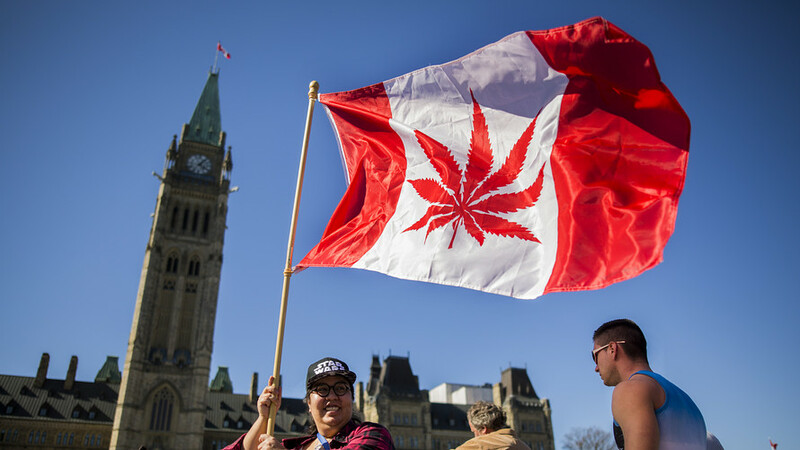 Cannabis stocks were mixed on Thursday after the Canadian government released statistics that showed the number of users of weed has barely changed since full legalization last October. About 4.6 million, or 15% of Canadians aged 15 and older, reported using cannabis in the last three months, according to Statistics Canada, the exact same number as reported in the third quarter and throughout 2018. A higher 19% of Canadians said they expect to use the substance in the next three months. Users of both legal and illegal weed were counted in the survey. The numbers will likely disappoint those analysts who expected legalization for adult recreational use to lead to a spike in consumption. The news comes as investors in the U.S. digest a widening crackdown on CBD, the non-psychoactive ingredient in cannabis that is widely held to have wellness benefits. CBD has been a popular additive in drinks, food and even cosmetics thanks to claims it can alleviate disorders such as anxiety and depression. But with little scientific research to back those claims, states and cities are moving to comply with U.S. Food and Drug Administration guidelines that do not allow CBD to be sold without prior approval. The recently passed Farm Bill legalized commercial hemp and there were hopes it would also legalize CBD, but instead, regulation of the substance was passed to the Food and Drug Administration from the Drug Enforcement Administration. Companies that were planning to launch products infused with CBD are now awaiting greater clarity on how it will be regulated. Smoke Wallin, president of cannabis company Vertical and chief executive of hemp and CBD company Vertical Wellness, said there is a lack of education on hemp and CBD products that is hampering the development of the industry. Among individual stocks, Ascent Industries Corp. sharesPGTMF, -23.97% were trading at 21 cents, after the Vancouver-based company said its license has been suspended and may be revoked by Health Canada. The government agency said it is still concerned that unauthorized activities with cannabis took place after the Canadian producer’s license and dealer’s license were granted to Agrima Botanicals Corp., a fully owned unit of the company. “Should the company not be successful in its attempt to have the licenses reinstated so that it may commence operations and generate revenue and cash flow in Canada, the company’s ability to continue as a going-concern may be in doubt,” the company said in a statement. The company is moving ahead with a strategic review with the aim of stabilizing its financial position. Canopy Growth Corp. shares CGC, -0.58% WEED, +1.58% were flat in midmorning trade. Chief Executive Bruce Linton told Yahoo Finance that the company is expanding its planned investment in hemp production in the U.S. to $500 million from an original $100 million to $150 million. Canopy, which is viewed as one of the stronger companies in the sector thanks to a $4 billion investment from Corona beer maker Constellation Brands Inc. STZ, +1.02% is planning to make and process hemp in New York after receiving a license to do so in January. it is now planing to also add hemp production in Rhode Island and two to three other states in the U.S. That will keep it from moving product across state lines and help it comply with the current regulations. Canopy also said Thursday that it plans to add C$30 million to its stake in Canopy Rivers Inc. RIV, -4.17% , CNPOF, -4.70% which it spun-off last year. Rivers is focused on investing in earlier stage cannabis companies. In a statement Canopy Growth said its stake would rise to roughly 27.4% of the company up from 26.5%. Rivers has invested in companies such as Headset, Greenhouse Juice Co. and Canapar. “By increasing Canopy Growth’s investment in Canopy Rivers, we are demonstrating our interest in growing great companies, developing selective opportunities and delivering Canopy’s shareholders more growth,” Canopy Growth Chief Executive Bruce Linton said. Amid its hostile takeover bid for Aphria Inc. APHA, +0.10% ,APHA, -1.02% Green Growth Brands Inc. said Thursday that it has made a deal with Authentic Brands Group to develop a line of CBD infused personal care products carrying Greg Norman branding. GGB said it will be buying CBD ingredients from cannabis producer Tilray Inc. Green Growth stock is up 7.3% on the CSE. In Canada amid a national supply shortage, Supreme Cannabis Co. Inc. FIRE, +4.25% SPRWF, +3.13% said it had struck supply deals with New Brunswick and Saskatchewan through its subsidiary 7Acres. The two supply deals bring the total number provinces Supreme has agree to supply to eight. In New Brunswick the company will supply the government-run cannabis buyer and in Saskatchewan, it has been registered as a supplier in the province. Supreme shares are up 1.9% in Thursday trading. Elsewhere in the sector, Tilray TLRY, +2.35% was down 1.7%, Aurora Cannabis Inc. ACB, +3.21% was up 2.7%, Aleafia Health Inc. ALEF, -3.11% ALEF, -3.11% was down 2% and Hexo Corp.HEXO, +0.73% HEXO, +3.28% was up 1.7%. The Horizons Marijuana Life Sciences ETF was up about 1% and the ETFMG Alternative Harvest MJ, +1.65% was up 0.8%. The S&P 500 SPX, -0.94% was down 1.4% and the Dow Jones Industrial Average DJIA, -0.87% was down 1.3%.